Maximilian Adalbert "Madcap Maxie" Baer (February 11, 1909 – November 21, 1959) was a famous American boxer of the 1930s, onetime Heavyweight Champion of the World, and actor. One of the most devastating right-handed punchers in heavyweight history, Baer was a wise-cracking performer whose ring antics entertained boxing audiences during the Great Depression. Baer turned pro in 1929 and won 22 of his first 24 fights, nine with first-round knockouts. However, in 1930, Baer's opponent Frankie Campbell died as the result of a Baer knockout. Two years later, another Baer opponent, Ernie Schaaf, died following a bout with Primo Carnera, and Schaaf's death was partially attributed to the beating he had earlier suffered from Baer. While keeping up his clowning and even profiting from his "killer" image in public, Baer was reportedly internally shaken by these deaths. The zenith of Baer's career came in 1933 when he donned shorts emblazoned with a Star of David and beat the highly touted German fighter Max Schmeling at Yankee Stadium before 60,000 fans, during the height of the Nazi era. Baer then took the heavyweight championship title from Primo Carnera in 1934. Baer also starred in films and was a well known man about town before marrying in 1935. At the height of his career, Baer shockingly lost the title to James J. Braddock, the "Cinderella Man," in his first defense. For the next six years, Baer compiled a record of 30-4. He then retired, working as a film and television actor and in a successful nightclub act. He also refereed boxing and wrestling matches. Baer died of a heart attack at age 50 in Hollywood, in 1959. Baer was born in Omaha, Nebraska, the son of a Jewish German immigrant Jacob Baer (1875–1938) and Dora Bales (1877–1938). The family moved to Colorado before siblings Bernice and Buddy were born. In 1921, when Max was 12, they moved to Livermore, California, to engage in cattle ranching. Baer's father was also a butcher, and Max often credited his carrying heavy carcasses of meat for developing his powerful shoulders. In 1929, Baer turned professional, progressing steadily through the ranks winning 22 of his first 24 fights. However, a ring tragedy little more than a year later almost caused him to drop out of boxing for good. Baer fought Frankie Campbell on August 25, 1930, in San Francisco and, with only two blows, knocked him out. After lying on the canvas for nearly an hour, Campbell was transported by ambulance to a nearby hospital, where he eventually died of massive brain hemorrhaging. An autopsy revealed that Baer's devastating blows had knocked Campbell's entire brain loose from the connective tissue holding it in place within his cranium. Baer was charged with manslaughter, but was eventually acquitted of all charges. Nevertheless, the California State Boxing Commission banned him from any in-ring activity within the state for the next year. Baer gave purses from succeeding bouts to Campbell's family and helped put his children through college, but lost four of his next six fights. He fared better when Jack Dempsey took him under his wing. Dempsey taught the fighter—who relied on an all-out display of superior strength—how to shorten his punches for greater efficiency and to avoid counter shots. The Campbell incident earned Baer the reputation as a "killer" in the ring. Campbell's death was also used for promotional purposes to make Baer seem dangerous. This publicity was further sensationalized by Baer's 1932 rematch with Ernie Schaaf, who had bested Baer in a decision a few years earlier. At the close of the tenth and final round, Baer hit Schaaf in the temple with what some witnesses claimed to be the hardest right hand that ever connected in boxing. Schaaf was saved by the bell, but he ended up losing the bout by decision. Several minutes passed before Schaaf was revived enough to stand under his own power. Schaaf was never quite the same after that bout. He complained frequently of headaches and his ring performance lagged immensely in succeeding bouts. Six months after the Baer fight, Schaaf died in the ring after taking a left jab from the Italian behemoth Primo Carnera. Although Carnera was vilified as a "man killer," others claimed that Schaaf had died as a result of damage previously inflicted by Baer. The death of Campbell and accusations over Schaaf's demise profoundly affected Baer, even though he was ostensibly indestructible and remained a devastating force in the ring. The highlight of Baer's career came in 1933 when he beat the highly touted German fighter Max Schmeling at Yankee Stadium before 60,000 fans. Baer's trunks displayed an embroidered Star of David, which Max swore to wear in every bout thereafter. Baer pummeled Schmeling and referee Arthur Donovan stopped the fight in the tenth round. Schmeling was Hitler's favorite, and Baer immediately became the champion of Jews, those who identified with Jews, and those who despised the Nazis' racial policies. Now in line for the world heavyweight title, Baer fought Primo Carnera in June 1934 at Madison Square Garden before a throng of 50,000. Baer knocked the giant Carnera down 11 times, winning in the eleventh round to take the championship. Then, on June 13, 1935, one of the greatest upsets in boxing history transpired in Long Island City, New York, as Baer fought down-and-out boxer James J. Braddock. After a grueling back-and-forth battle, Braddock won the heavyweight championship of the world as a 10-to-1 underdog. Braddock took heavy hits from Baer, but kept coming at Baer until he wore Max down. At the end, the judges gave Braddock the title in a unanimous decision. The fight has since become a boxing legend. Baer's career, however, was far from over. For the next six years, Baer compiled a record of 30-4. In a 1935 fight, Baer fought Joe Louis and was knocked out in the fourth round, the first knockout Baer suffered in his career. He fought Lou Nova in the first televised heavyweight prizefight on June 1, 1939, on WNBT-TV in New York. His last match was another loss to Nova, in 1941. Baer boxed in 84 professional fights from 1929 to 1941. In all, his record was 72-12-0 (53 knockouts), which makes him a member of the exclusive group of boxers to have won 50 or more bouts by knockout. Baer defeated the likes of Walter Cobb, Kingfish Levinsky, Max Schmeling, Tony Galento, and Tommy Farr. He was Heavyweight Champion of the World from June 14, 1934, when he knocked out Primo Carnera, to June 13, 1935, when his reign ended with the Braddock fight. Baer's motion picture debut was in The Prizefighter and the Lady (1933) opposite Myrna Loy and Walter Huston. In this MGM movie he played Steven "Steve" Morgan, a bartender turned boxer. Featured were Baer's upcoming opponent, Primo Carnera, as himself and Jack Dempsey, also as himself, acting as the referee. On March 29, 1934, The Prizefighter and the Lady was officially banned from playing in Germany at the behest of Joseph Goebbels, Adolf Hitler's minister of Propaganda and Public Entertainment. When contacted for comment at Lake Tahoe, Baer said, "They didn't ban the picture because I have Jewish blood. They banned it because I knocked out Max Schmeling." Baer acted in nearly a score of movies, including Africa Screams (1949) with Abbott and Costello. A clown in and out of the ring, Baer appeared in a popular vaudeville act and on his own TV variety show. He appeared in Humphrey Bogart's final movie, The Harder They Fall (1956), opposite Mike Lane as Toro Moreno, a fictionalized version of Primo Carnera. Baer's nightclub act, both individually and with boxer Slapsie Maxie Rosenbloom, was a big success. He also refereed boxing and wrestling matches. Baer's son, Max Jr., achieved fame in the the role of Jethro Bodine in the long-running television comedy series, The Beverly Hillbillies. However, Baer died before he could see his son achieve entertainment fame. Baer additionally worked as a disc jockey for a Sacramento radio station, and for a while he was a wrestler. He also served as public-relations director for a Sacramento automobile dealership and referee for boxing and wrestling matches. Baer married twice, to actress Dorothy Dunbar (married July 8, 1931 - divorced 1933), and then to Mary Ellen Sullivan (married June 29, 1935 - until his death, in 1959). With Sullivan, he had three children, actor Max Baer Jr. (born 1937), James Baer (born 1941), and Maude Baer (born 1943). During a separation from his first wife, Max had an affair with movie star Jean Harlow. At the time of his death on November 21, 1959, Baer was scheduled to appear in some television commercials, which he had planned to do in Los Angeles, before returning to his home in Sacramento. 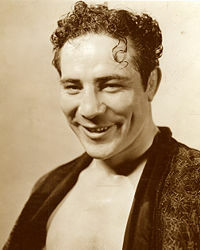 After refereeing a boxing match in Phoenix, Baer traveled to Los Angeles and checked into the Roosevelt Hotel in Hollywood. While shaving in the morning, he suffered a heart attack and summoned a doctor. He eventually died in the hospital. Baer is interred in Saint Mary's Mausoleum, in Sacramento. Max Baer's legacy is somewhat mixed. On one hand he was a great fighter, with one of the hardest right-hand punches in heavyweight history. However, he will forever be known for contributing to the deaths of two opponents, one in the ring and the other soon after. His antics of clowning in the ring and taunting his opponents further contributed to his negative image. However, he was able to put his theatrical sense to use in films, television, and a nightclub act. Today, Baer is remembered mostly for his defeat of Max Schmeling, the heavyweight champion of the Nazis, who were shocked to see a part-Jewish fighter beat their man. His portrayal in Ron Howard's film Cinderella Man does not due him justice, portraying him in caricature without crediting him with the redeeming qualities which, by nearly all accounts, he possessed. Inducted into the Boxing Hall of Fame in 1968; the World Boxing Hall of Fame in 1984; and the International Boxing Hall of Fame in 1995. The 1998 Holiday Issue of Ring ranked Baer number 20 of "The 50 Greatest Heavyweights of All Time." In Ring Magazine's 100 Greatest Punchers (published in 2003), Baer is ranked number 22. Max Baer Park in Livermore, California, is named for him, as is another a park in Sacramento. ↑ The allegation that Baer was responsible for damaging Schaaf's brain has since been refuted by information gathered from Schaaf's autopsy. Fleischer, Nat. Max Baer: The Glamour Boy of the Ring. Press of C.J. O'Brien, 1949. Site about Max Baer www.MaxBaerBoxer.com. Max Baer at the Internet Movie Database. www.imdb.com. This page was last modified on 5 September 2018, at 16:14.